Who said anything was ever fair? Billionaires don’t easily fall–unless they are up against another oligarch. With the Russian Presidential election drawing ever closer, the main challengers need to make their move. Ousting Putin is not going to be easy–and there are men to be removed before anything becomes possible. With the Games at their ten-year celebration, the rules are reset for one massive Hunt. For those involved, there are no guarantees on anything–claiming their millions a hope, death in the process a real possibility. 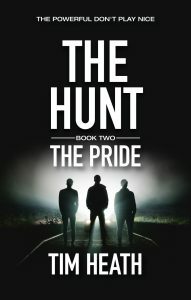 From the Best Selling author of The Tablet, comes the second instalment in The Hunt–his most jaw-dropping series yet! ★★★★★ Murder, Spies and Mayhem! This is the first Tim Heath book I am reading and it definitely won't be the last! Such precision, such attention to detail and one hell of a story line! A story that includes money, lots and lots of money and you know what people will do for it, well they do it! Murder, spies, foreign countries, power – what more could a person ask for in a book! You need your wits about you when reading this book so you don't forget who the main players are as it is easy to stray if you don't keep your eye on the ball! A hell of a good story Tim Heath and I shall certainly be reading more of your books, thank you! ★★★★★ A deep thinkers mystery!! Given a free advance copy, I have decided to review this book because I loved it. This is the first time I have read any of Tim Heath's work–but I am a fan! Mr. Heath writes well and the fact that he has lived in Russia and Estonia shows in the book. He may be English but he has a great understanding of how things work in certain countries. Thought provoking and suspenseful, this book should not be read when you are tired–you will miss important clues. Put your thinking cap on!! ★★★★★ MI6 and FSB agents team up to track down the people responsible for the game. Take 1 host, add 20 billionaires all jockeying for the top 10 spots in their group. Add 10 contestants who were given money and other incentives to compete in a dangerous game. The winners of the game will go on to complete for only 5 lottery tickets. What would they do to each other to compete for the life-changing millions these lottery tickets are worth? MI6 and FSB agents team up to track down the people responsible for the game. This was a very exciting book that I read in one day. I couldn’t put it down. An exceptional and intriguing book, with strong character development. And yes the character list at the back is most helpful for an oldster like me who has some difficulty in remembering “Bill from Bob”. Look forward to reading more of Tim's books. I enjoyed this thriller, it was great to get to know the oligarchs better. When books get into economics I don't really understand how everything works but it is interesting nevertheless. I also like Alex and Anissa and how they work together. Russia is a great scenario! I especially enjoyed it as I have a bit of knowledge of the Russian language and also have visited Russia when it was still the Soviet Union and St. Petersburg was Leningrad. Much has changed since but all the great sights featuring in this book are still the same! I'm very much looking forward to part 3, to have all the threads go together.If you like thrillers with great and well thought-through backstories, this is the book for you! This is the second book in The Hunt series and is another exciting piece of intrigue and suspense. The ultra rich and powerful are once again out fighting for more power, more influence and more glory with a greed and disdain for their fellow human that is mind-blowing. Can our two secret agents ever get ahead of those with so much money and influence? Or will they always be chasing shadows but never really seeing the true evil at the hearts of these men of power? You will just have to read it to find out! ★★★★★ The Games of the Ultra-Rich are Different! What do you do for fun when you have huge wealth? Tim explores the games that the ultra-rich members of the Russian oligarchy play to amuse themselves. The challenge for our protagonists, Anissa, Alex, and Sasha, is to uncover and stop the clandestine working of this group of 20 oligarchs while they continue their hunt and avoid becoming the hunted. Tim paints a vivid picture of each of the characters including the locale of much of the adventure – St. Petersburg. Interesting read that weaves the whole story. Most authors only share from the perspective of 1-2 characters but this author does a great job of sharing many character's stories and perspectives. You are kept guessing throughout where it is going and how the story will end up. Highly recommended for anyone that enjoys unique and interesting styles of storytelling and really being brought into the lives of the characters. ★★★★★ Tim Heath has another winner! Tim Heath has another winner! Although the book has a lot of characters to keep track of, particularly in the beginning, you can still follow the action. It takes place in Russia so there are a lot of Russian names that are a bit difficult for our American tongue but you do get use to them. By the end of the book you have no problem remembering who is who. It is action packed and you want to keep reading to find out what happens. A very enjoyable read. Can't wait for the next one. ★★★★★ You must read it! WOW! A mind trapping story that you can't get enough! It is so good as the first one and I can't wait for the next one! This is the first book I've read in a while that I actually had to concentrate on – lot's of characters, so I didn't want to mix them up, lot's of them had Russian names too which made it slightly harder to retain them for me. But so worth it! It's a fantastic book – the construction of both plot and characters is fabulous. It's one that I didn't want to put down – a fantastic thriller! I just finished this extraordinary book – buy it! Why? Tim Heath has woven an intricate thriller that will keep you captivated all the way through. It is massively involved with dozens of characters that he probes in detail. To help us mere mortals that read it, Tim graciously has like a character profile list of everyone in the back of the book. Nice guy! You already know that Tim Heath is one of the new up and coming young authors so jump right in on this book as the story will continue after this novel ends! Such an intriguing middle entry in a trilogy that allows more revelations, but still without giving too much away! Clever. Fun and enlightening, this tale continues deeper into the machinations of Russian political players (even Putin makes an appearance! ), but also returns to one of the previous entry's characters as he continues to survive on the run. A great mix of high-echelon power plays with grassroots survival. Yet another gripping page-turner from this author. The story follows on from the previous novel, and gets into more detail while fleshing out the characters more. The story cracks along and is really hard to put down. If you like spy/thriller themes, then get both books in this series. I can't wait for the next book…..
★★★★★ Complex, intriguing, draws you into a devious world of corrupt power. Looking for a light, easy read? Don't choose this book! This will keep your brain ticking as you try and keep up with the complex web of dirty deeds played out by the wealthy. There is a lot to keep up with as 20 rich super powers battle to be top dog, dragging ordinary people into their path of destruction. A very clever story line with lots of twists. It is hard to see where the plot is heading so it kept me hooked right through to the end. Now I am left hanging as I wait for book 3! Well done Tim, a very imaginative, original and gripping novel. I can't wait for the next one! ★★★★★ When the mega-rich play they play big, mean and for keeps! A brilliant sequel to The Prey giving us an insight into the murky world of the oligarchs who toy with human emotions and indeed lives to sate their deepest, darkest, desires. Superb! A very well written second book in the trilogy following on seamlessly from the first book. Still a lot of the same characters but we learn a lot more about them. There a lot of twists and turns and will keep you guessing until the end. Can't wait for the last book to be published. A truly thrilling book. Loved it. Really twisty story, very believable with the money people. Read it to believe it.